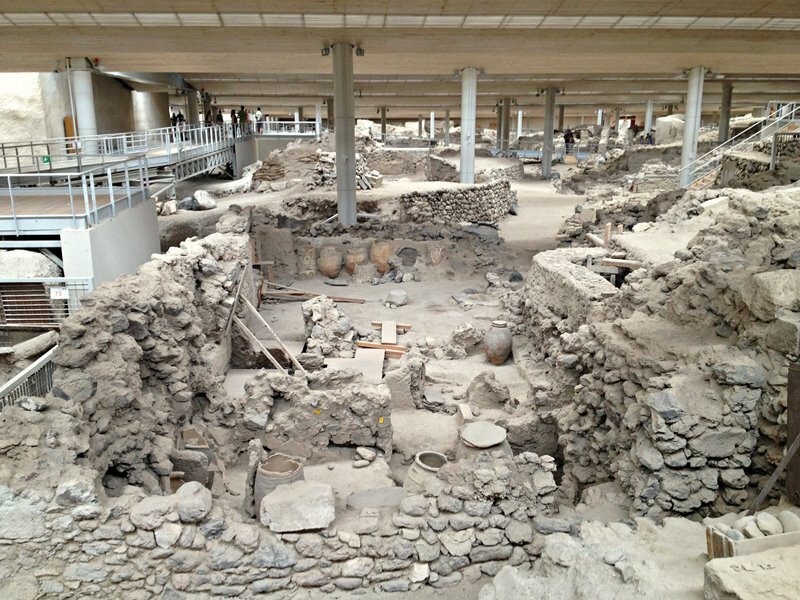 Akrotiri is a fantastic archaeological sight on Santorini. Like Pompeii, it was a bustling town until a volcanic eruption smothered it. *This post was updated May 2017. I’ve been to Pompeii outside of Rome and walking through that huge archaeological sight was pretty amazing. Akrotiri is a smaller version of that experience but no less fascinating. What remains today is a fantastically preserved site that gives you a glimpse into life around 1450 when the Minoan civilization was at its peak. 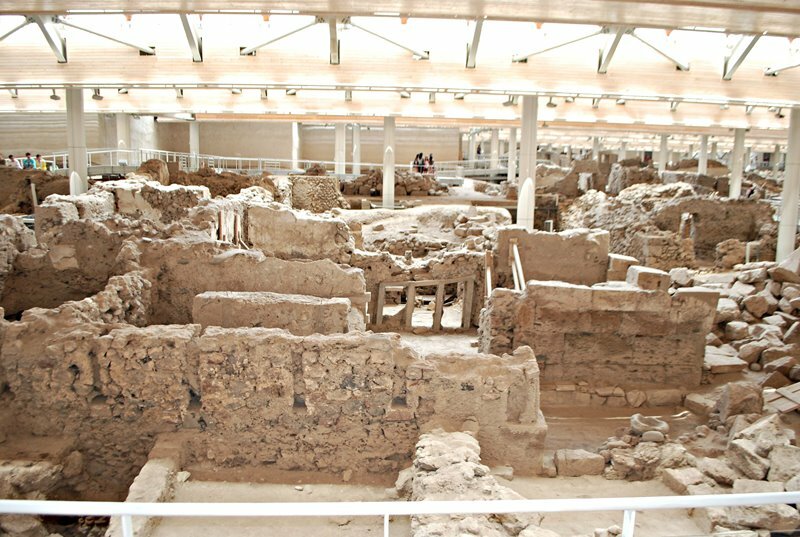 Akrotiri is comfortably housed underneath a roof, to protect it from the sun and other elements. 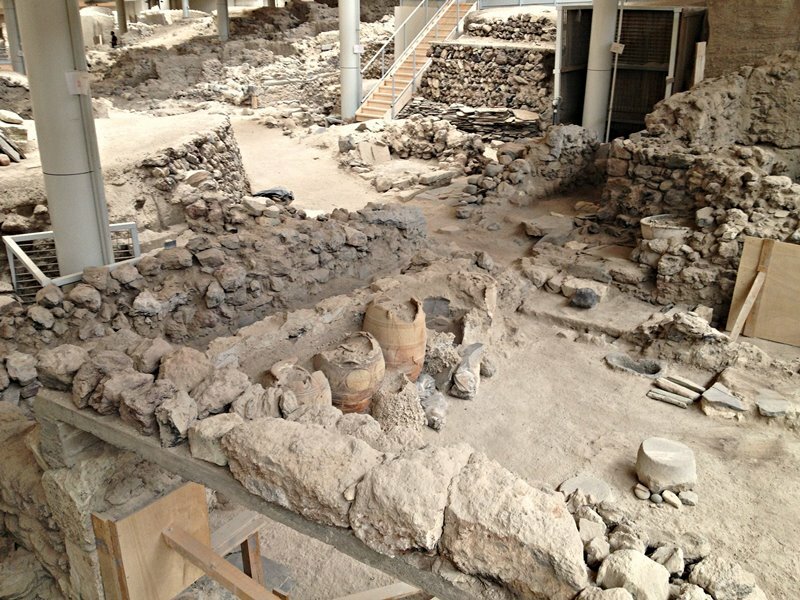 Akrotiri in Santorini is a must-see for history lovers. 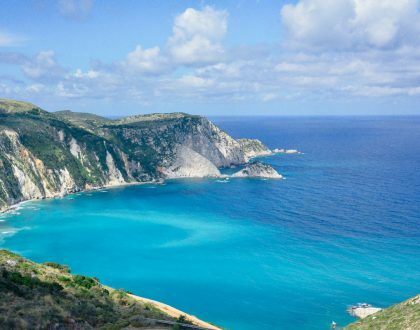 Scholars say the volcanic explosion was so powerful that it destroyed the flourishing Minoan world on Crete as well. Beyond the new walkways inside the structure you can clearly see the way the streets, homes and even a square looked at the time. Tools and pots are still where their owners left them before abandoning the town. Unlike Pompeii, no human remains were discovered here. It seems the people had enough warning of the town’s destruction. They likely were able escape by fleeing in boats. According to scholars, beds were discovered outside of the homes which suggests that people preferred to sleep outdoors as the island continued to shake from earthquake activity. My sister trying to break the law. Can’t take her anywhere. The Greek Pompeii is fascinating to walk through. For more information, visit the official site page here. 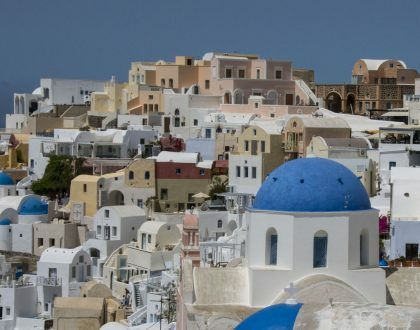 International travelers can get to Santorini by plane, usually with a stop in Athens. Check Vayama for the best flight deals. I highly recommend booking with Blue Star Ferries which leaves from the Athens port of Piraeus. Santorini is a big island. It takes about an hour drive to get from the ferry port to Oia which is the furthest north. There is a KTEL public bus, find the schedules here. You can also rent quads, motorbikes and scooters which is a fun experience on any Greek island. A car is ideal to save time and you can rent one through Avis Europe – especially to go for a day exploring. I recommend Armeni Suites and Esperas Hotel in Oia. I have also stayed at the Sensyo Apartments in Firostefani and I recommend Grace Hotel, a luxury boutique stay in Imerovigli. For a boutique, close-to-the beach option head to Orabel Suites, a Tresor luxury boutique property, in Perivolos. Stay tuned for a full post with reviews about these Santorini hotels. 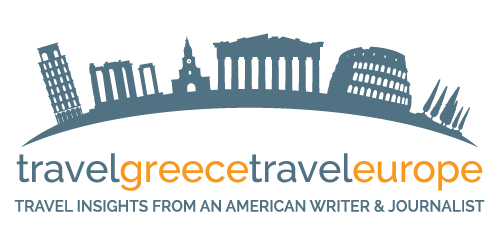 Have you ever visited a fascinating archaeological sight in Greece?